You can save energy, and therefore money on electricity bills, when you cook, simply by adopting a few easy habits. These will not only save you money directly by making your cooking more efficient, they’ll keep you from spending extra money on cooling your home, since you’ll avoid excess heating in the cooking process. By implementing these tips you could save a lot of money over the course of your life, and avoid all the pollution and carbon emissions associated with it. 1. Match your pot size to the coil size. When you’re cooking on the stovetop, match the size of the pot or pan you’re using to the size of the coils on your stove. 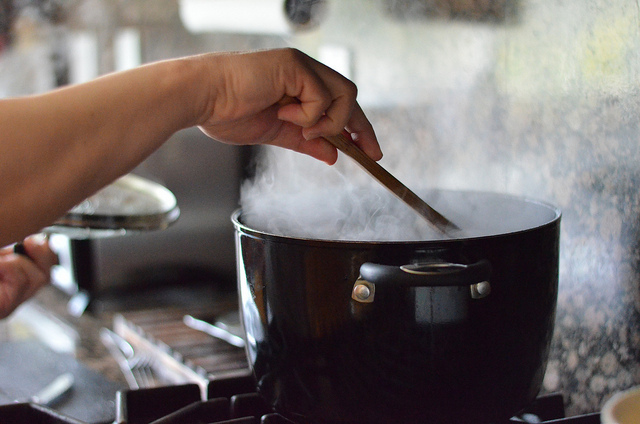 If you cook a small pot on the large coil, you’re wasting 30-40% of the electricity needed, and you’re also putting a lot of extra heat in your house that may need to be offset by A/C or fans. Even if it’s cold out and you like that extra heat, it’s an inefficient way to generate that heat, so best bet is just to match coil size and pot size. The difference is subtle, but note that the pot on the right doesn’t touch all the coils—that’s wasted energy…and money. 3. Check your reflectors. 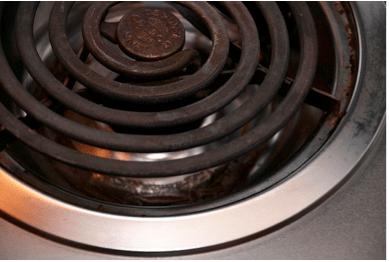 The metal “drip trays” underneath your stove burners serve two main purposes. First, is what most people understand it to be: a place to catch spillover drips from your cooking. But, it serves an energy efficiency service as well by reflecting heat back up to the pot or pan you’re cooking in. So, if your drip tray is caked over in previous drips, or if it’s degraded to the point of having holes and rust, it’s not doing as effective a job of reflecting heat. 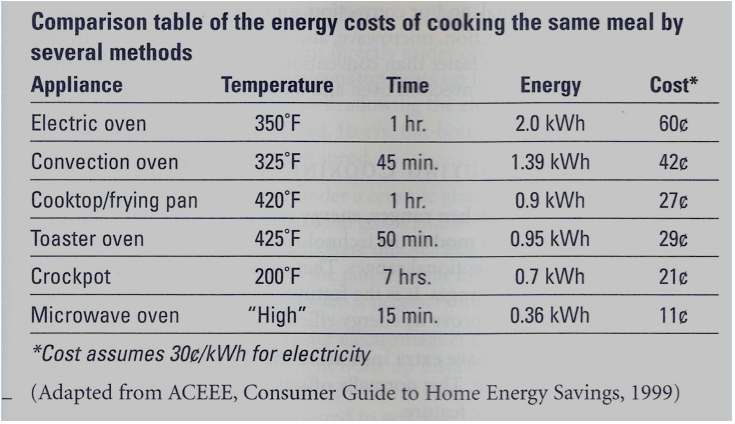 Therefore you’re using extra electricity to cook with. Depending on how much you cook on the stovetop, it may be worthwhile to replace these — they typically cost a few bucks each at a local hardware or housewares store. If you don’t cook often, you can just plug in a temporary solution by wrapping your existing (degraded) drip trays with aluminum foil, which also reflects heat. Note, however, that aluminum foil is a lot harder to keep clean than new drip trays. 4. Use your oven effectively. If you do some baking or other cooking with your oven, there are some things you can do to most efficiently use the heat it creates. Taking advantage of the oven light is a tremendous energy saver, as opposed to opening the oven door to check on your food. Checking brownies with a fork for gooiness may be an exception. But, if you don’t have to open the oven door and let all that heat escape, just use the light to look at your food, and you won’t waste all that heat in the oven. 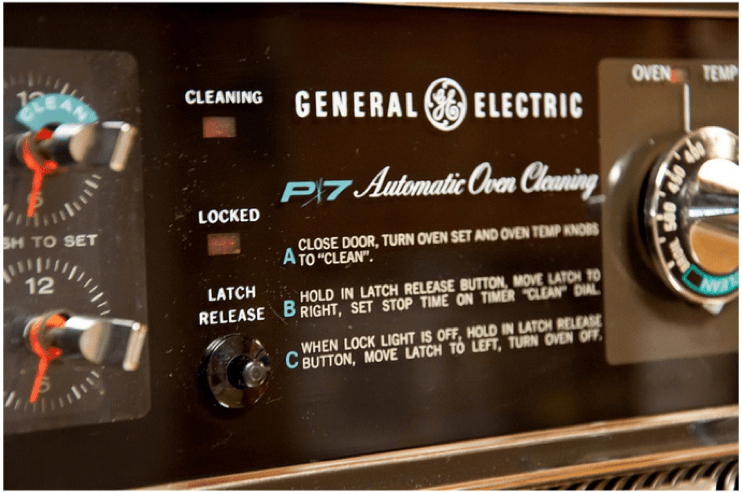 Your oven will just have to use a lot of extra electricity to recreate that lost heat. Just to be sure, you can put the pan you’re going to be using into the oven prior to heating it up so that you can check whether it’s in the right place so you can see it when you turn on the oven light. You can be more energy efficient by using the oven light to check your food creation (left, above). Opening the door makes the oven work harder to reheat itself (right, above). If you use the self-cleaning option, use it right after you bake something else. This way, you’ll reuse the heat you have built up in the oven! 5. Consider cast iron. Cast iron cookware is a healthier option than many other types, and additionally has some energy efficiency benefits. When you scratch a Teflon pan, for instance, it begins a slow, steady, and inevitable process wherein Teflon chips off and enters your food while you cook with it. MMM…Teflon seasoning…zesty! (see “How Toxic is Teflon?“, also on Green Living Ideas). Using a cast iron skillet, on the other hand, takes away the possibility of getting Teflon in your diet! Additionally, you can cook on a lower heat setting with cast iron than you can with nonstick or stainless steel cookware, thus saving you money. If you get a piece of cast iron cookware, simply try cooking the same way you did before, except lower the heat down one or two notches. The results should be the same, minus the Teflon “seasoning,” of course. 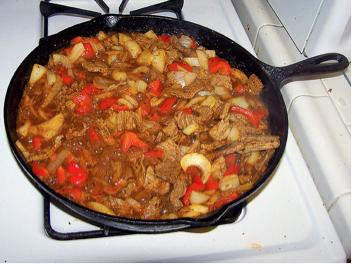 Check out this article to learn more about how to cook with cast iron pans. 6. Pre-measure your water for boiling. If you make tea, use a French Press for coffee, or boil specific amounts of water for a recipe, pre-measuring how much you’ll need. This allows you to boil exactly the amount of water needed for your beverage and not a drop more. Heating water is energy intensive, so if you can avoid boiling extra water, it’ll save you electricity and money, while reducing the amount of needless heat you release into your kitchen from the range (as we mentioned, even in a cold winter, this is a very inefficient way of heating!). To brew the perfect cup, just fill the teapot or French Press with the water you’ll need, pour it into your heating device, and, easy as that, you’ve boiled just the right amount, guaranteeing you’ll be faster, and use less energy. 7. Cover foods while cooking. Putting a lid on your food while you’re cooking is a great way to make your kitchen more energy efficient. Not only will it reduce your foods overall cook time, it will help to limit the amount of heat being introduced into your home (which keeps your A/C from working harder). So the next time you’re cooking some food, “put a lid on it”. 8. Or….cold brew coffee and tea. A great way to save money and still start your day with a cup of coffee or tea is to cold brew it. Just take a French press, fill it with water, put ground coffee or a tea bag in it for the next morning, and let it brew on your counter overnight. 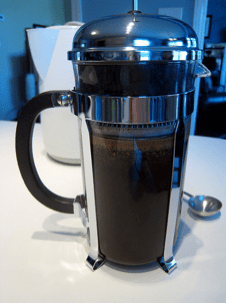 Check out this article from FeelGoodStyle for some cold brew coffee ideas. Let’s see just how much money cold brewing your coffee could save you: A burner on high on an electric stove top uses, on average, 1.25kWh. Assuming it takes 8 minutes (8/60 or .13minutes) to bring the water needed for your french press to a boil, you’ll be using .163kWh per boil. If you make coffee everyday, that adds up to 59.9kWh per year. Factor in the energy rate ($.3448 per kWh) and that coffee costs you $20.45 per year to enjoy it hot. Switch to cold brewing, and you’ll save that money instead of spend it. 9. The pasta principle. Here’s a nifty trick, the next time you’re cooking some pasta, rice, oatmeal, or other grain, use what we call the “pasta principle”! Basically, just turn off the burner after only boiling for a few minutes and put a lid on the pot. The grains will absorb the residual heat and soften up, and it should only take a few more minutes than if you were to leave the burner on the entire time you were boiling. Doing so will reduce the amount of energy used to prepare your meal and you’ll still get the same results. 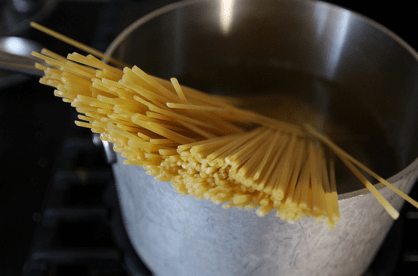 Let’s take a look at just how much the pasta principle can save you: Assuming you boil your noodles on a medium heat (which uses .625kWh) and you boil for 15 minutes (.25hr), that’s a total of .156kWh per boil. Multiply that by, lets say 120 meals per year, and then factor in the cost per kWh (which on Oahu is $.3438) and those noodles are costing you $6.44 per year. Now, if you follow the pasta principle, and boil those noodles for only a minute, those noodles will only cost you $.43 per year. Which is a savings of $6.01. Not bad. The following photos are courtesy of the Flickr Creative Commons (boiling pot, reflector, automatic oven cleaning, cast iron skillet, covered boil, cold brew coffee and pasta principle) and Pono Home.